There are many types of filling materials available, each with their own advantages and disadvantages. You and your dentist can discuss the best options for restoring your teeth. 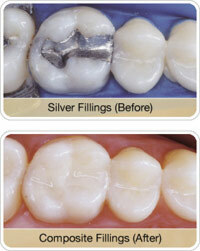 Composite fillings, along with silver amalgam fillings, are the most widely used today. Because composite fillings are tooth colored, they can be closely matched to the color of existing teeth, and are more aesthetically suited for use in front teeth or the more visible areas of the teeth. They are very durable, and will last many years, giving you a long lasting, beautiful smile.